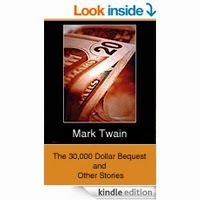 Bringing together 38 tales and sketches, The $30,000 Bequest provides a rare long view of Twain's work, covering virtually his entire career, from "Advice to Young Girls" (a spoof that appeared in 1865, just months before he achieved national acclaim for his "Jumping Frog" tale), to the title story, written in 1904. In The $30,000 Bequest story, Sally and Aleck have a happy life with two daughters. They are not rich but are comfortable. Aleck (her nickname) had invested some money early on in the marriage and was a wise business woman. Sally (his nickname) was also thrifty although not as much so as his wife. When a distant relative sends them a note telling them that he is going to leave them $30,000 upon his death they are thrilled. Only, they can't tell anyone, Ever. . .